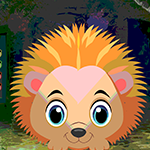 G4K Hedgehog Rescue is another point & click escape game developed by Games4King. There were a few houses in a beautiful and magnificent village. The location and the housing was very beautiful. There was a hedgehog in that place. The hedgehog was unexpectedly stuck in a house in a day. It is your duty to save the hedgehog from there. Find hints and clues to save the animal. Good Luck and have fun! Haads up- berries placed separately even tho they look like a pair, and there's a (hopefully accidental) word clue that some people may find VERY offensive! I'm not having any luck with the lolly colors.